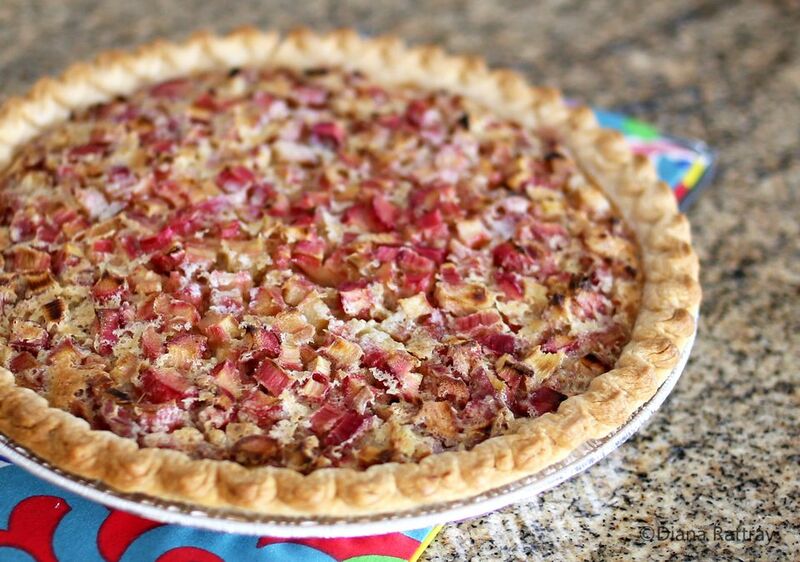 This fabulous rhubarb custard pie is adapted from a vintage recipe leaflet from Washington State Rhubarb Growers. It's such a simple recipe, and if you use a frozen or ready-made pie crust, it takes no more than 15 minutes to prepare. A small amount of nutmeg adds flavor to the pie but feel free to use ground cinnamon instead. The all-butter pie crust is easy to fix with a food processor, but you can cut prep time by about half if you make the pie with a frozen pie crust. Feel free to use frozen or homemade pastry, or use refrigerated pie pastry sheets. Serve this pie at your next cookout or take it along to a potluck dinner. This is a fantastic way to use fresh rhubarb, and your family and friends will love it. It's no wonder rhubarb was once called "the pie plant!" To make the pie crust, combine the 1 1/4 cups of flour with the 1/2 teaspoon of salt, and 1 teaspoon of sugar in a large bowl. Whisk to combine thoroughly. Add the 8 tablespoons of cut-up butter and work it into the flour mixture with fingers or a pastry blender. You should have some pea-size pieces of butter still intact. Stir in 4 tablespoons of ice water. Add more ice water, about 1 teaspoon at a time, just until the mixture begins to hold together. Turn the dough out onto a floured surface and press until you have a smooth dough. Do not overwork or the crust will be tough. Shape it into a flattened disk and refrigerate for 30 minutes. Roll the dough out into a circle about 11 inches in diameter. Line a 9-inch pie plate with the dough and crimp the edge as desired. In a large bowl, combine the diced rhubarb with the sugar, flour, salt, and nutmeg; blend thoroughly. In another bowl, whisk the eggs with the milk. Add the egg mixture to the rhubarb and stir until blended. Turn the rhubarb mixture into the prepared pie crust. Dot with butter. Bake in the preheated oven for 45 to 55 minutes, or until set. Remove the pie to a rack to cool completely before slicing. Serve rhubarb custard pie with a big dollop of freshly whipped cream or ready-made whipped topping.